Is Teck Resources Ltd a Buy? This miner is moving into a fourth major commodity, which will materially diversify its business and should make it a much more valuable company. Teck Resources Limited (NYSE:TECK) and its partners are putting the finishing touches on a new mining project. Once completed, it will take this diversified Canadian miner into an entirely new commodity. So far, this project has been a cost center, but that's set to change very soon. Here's what you need to know and why it could make Teck a solid buy for investors interested in owning a diversified mining stock. In 2013, Teck teamed up with Canadian oil sands expert Suncor and France's Total to build the Fort Hills Oil Sands project. About eight months later, oil prices started their plummet from over $100 a barrel to a low below $30. What looked like a great project in late 2013 suddenly looked like an albatross. With commodity prices already suffering more broadly through a deep downturn, some investors feared Teck wouldn't be able to fund its share of construction costs at a project that wasn't nearly as desirable as it had been when first approved. Teck's stock plummeted during the commodity downturn, with the decline exacerbated by the perceived risk of the Fort Hills project. Management had to make some aggressive decisions. This included such things as inking a large silver streaming deal at its Antamina Mine in Peru with streaming-and-royalty giant Franco-Nevada in 2015, increasing its debt load, and selling off non-core assets. But Fort Hills construction never stopped, and equally important, Teck proved it was strong enough to meet its financial obligations. Things have only become easier since commodity prices started to rebound in early 2016. At this point, Teck has begun to pay down debt and even buy back stock. Progress on the debt front has been pretty impressive, too, with long-term debt falling by roughly a third between the end of 2015, when debt levels peaked, and the first quarter of 2018. The company now boasts of its financial strength, including $5.1 billion of liquidity at the end of the first quarter. And Fort Hills is just about ready to start contributing to the top line. That's the setup for a brighter future at Teck. The miner's business has historically been driven by metallurgical coal (used to make steel), copper, and zinc. As Fort Hills ramps up to full production levels through the end of the year, Teck will add oil to the mix. That will materially increase the company's diversification. Teck's analyst day update for Fort Hills. Image source: Teck Resources Limited. However, there's another important aspect to Fort Hills. This is an oil sands project and the biggest costs are in the construction of the mine. The ongoing costs are relatively low, with Teck estimating that first-quarter cash costs were in the $35 to $40 a barrel range, based on initial production efforts. Moreover, Fort Hills has a massive 50-year reserve life. So Teck will be adding a new commodity with low operating costs to the mix that will be contributing to the top and bottom lines for decades to come. To be fair, Teck's financial results remain exposed to commodity prices. And that likely will be the largest driving force behind the company's stock price for the foreseeable future. In fact, Teck's shares are higher by more than 700% since hitting a nadir in mid-January of 2016. That improvement largely reflects the upturn in commodity prices and Teck's improved finances (most notably its balance sheet). But the addition of Fort Hills this year is a potential game changer because of both the revenue it will add and the revenue diversification it provides. TECK Price-to-Tangible Book Value data by YCharts. For example, Teck's price-to-tangible book ratio today is roughly around 1. Diversified miners BHP Billiton and Rio Tinto trade at price-to-tangible book ratios of 2 or more. 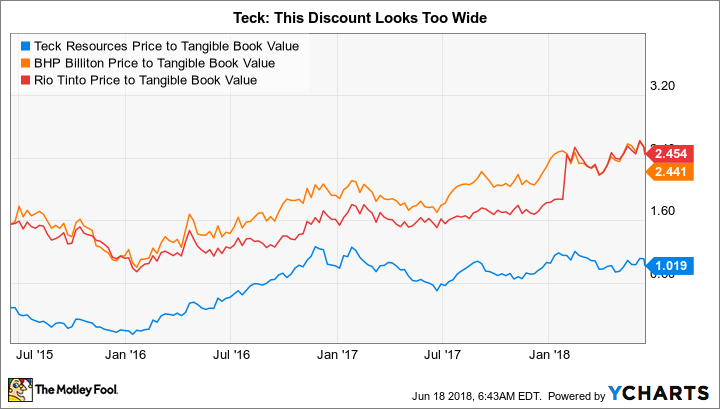 These are much larger and more diverse companies, to be sure, but the discount at which Teck trades compared to this pair still seems extreme since Teck slowly is beginning to look more like these industry giants, even if it's on a smaller scale. Teck and its partners expect Fort Hills to near its nameplate capacity of 194,000 barrels of oil a day by the end of 2018. At that point, Teck will be a very different company than it is today, with a much more diverse portfolio of commodities. While Teck's performance and stock price will always be tightly correlated with the prices of the commodities it produces, 2018 is a transformative year. As Teck begins to look more like its giant diversified mining peers, it's reasonable to expect investors to reward Teck with a higher valuation. There always will be commodity risk at Teck, but it still looks like an interesting opportunity, even after a huge price advance since early 2016. Why 2017 Was a Year to Remember for Teck Resources Ltd.
Will 2018 Be Teck Resources Ltd.'s Best Year Yet?